Region: These insects come in various species and can be found throughout North America, but is particularly serious in regions of high humidity. 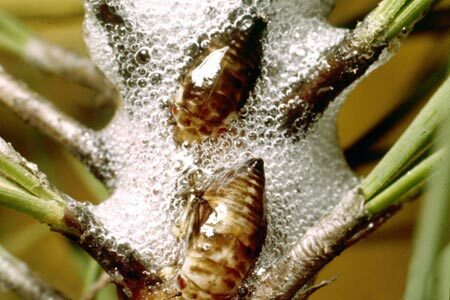 Life cycle: The spittlebug produces one generation each year and overwinters as an egg, which hatches in spring. Physical Description: This triangular, 1/4 to 1/3 inch long insect comes in light brown to green and usually has stripes on its wings. The eggs are laid in grasses, between the leaves and stem. The nymph is green and can be found in masses of froth or spittle that they produce. Feeding characteristics: This pest will attack chrysanthemum, corn, and many garden vegetables and fruits. The nymph is the stage that causes damage; adults apparently cause no visible trouble. Controls: rotenone is effective against this pest.